Workplace prosecutions are something that health and safety practitioners should maintain oversight of to identify trends. 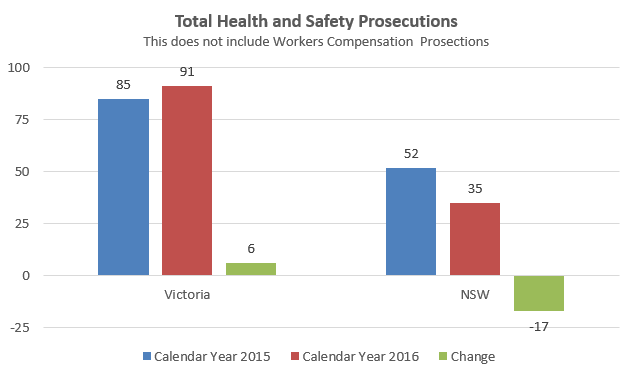 This article provides an overview of the prosecutions listed by WorkSafe Victoria and SafeWork NSW for Calendar Year 2016 as of 28 February 2017. During 2016, over $10,000,000.00 in fines were issued to businesses and workers in Victoria and NSW following breaches to health and safety legislation. 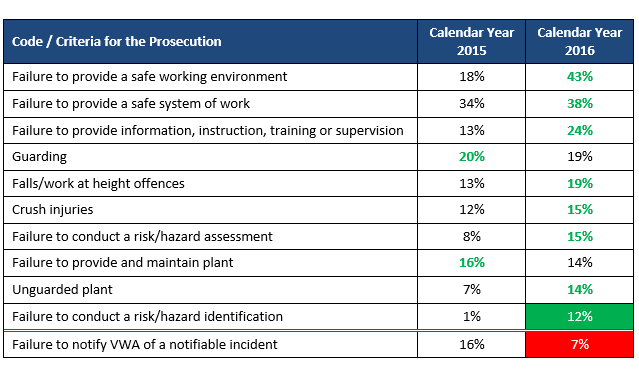 Calendar Year 2016 saw a total of 91 health and safety prosecutions in Victoria and 35 prosecutions in NSW. When compared to 2015, this is an increase in Victoria (6) and reduction in NSW (17). 1 prosecution involved both the OHS Act 2004 and the Dangerous Goods Act 1985. In addition, there were 25 prosecutions associated with the Workers Compensation legislation. 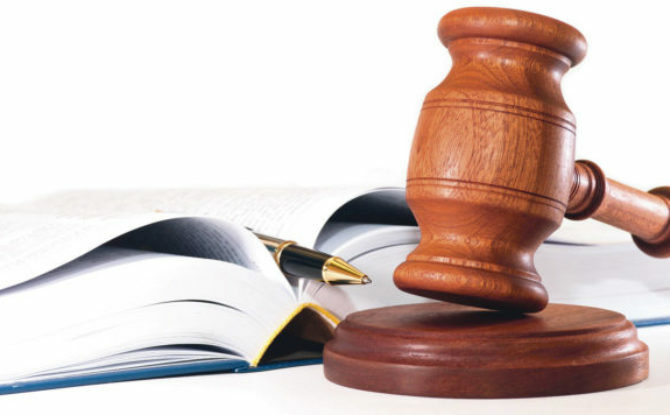 22 prosecutions were recorded against the Work Health and Safety Act 2011. The reduction in the prosecutions related to the OHS Act 2000 in NSW from 21 in calendar year 2015 to 1 in 2016 is related to this Act being superseded as of 1 January 2012 (5 years prior to 31 December 2016). Both the average and median time for a prosecution to occur in NSW (from the date of incident) where an outcome was established in 2016 was approximately 2 years and 8 months; the maximum time for prosecution being 5 years and 1 month (followed by 4 years and 2 months). 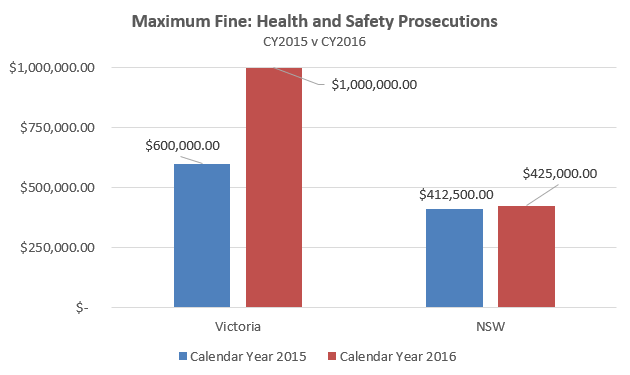 Year on year, both the average fine and median fine increased in both Victoria and NSW. The average fine exceeded $50,000 in both states. The average and median fines were greater NSW. In NSW each prosecution resulted in a fine. In Victoria, 93 fines were issued. This equates to 80% of prosecutions resulting in a “financial” fine. This is compared to 69% of the prosecutions in 2015. When considering the total direct cost associated with the the prosecution (e.g. court costs being issued, court funds being assigned, etc. ), all prosecutions in Victoria were financially impacted. Outside of issuing fines, WorkSafe Victoria issued 6 Enforceable Undertakings (this is compared to 7 Enforceable Undertakings being issued in 2015). In these cases, the Enforceable Undertaking is a legally binding agreement between WorkSafe Victoria and the employer. The employer is obliged to carry out the specific activities outlined in the undertaking. Such scenarios ensure that the workplace implement agreed corrective actions. The offender failed to provide a safe system of work which resulted in an employee being crushed by a trailer carrying a 20 foot shipping container when undertaking duties associated with his role – Victoria: $1,000,000. A worker was fatally injured when he fell approximately 5 metres through a penetration at a construction site – NSW: $425,000. If you were of the belief that health and safety prosecutions were limited to corporations- think again. In 2016, 10% and 34% of prosecutions were issued to workers in Victoria and NSW respectively. (ii) outlining the positive due-diligence duties placed on these officers. A worker was seriously injured when he fell 3-4 meters to the ground at a residential construction site. An employee was performing unscheduled maintenance on plant and equipment that did not have adequate guarding. The employee had not received any information, instruction or training with respect to maintenance. He sustained a partial amputation of the right arm. 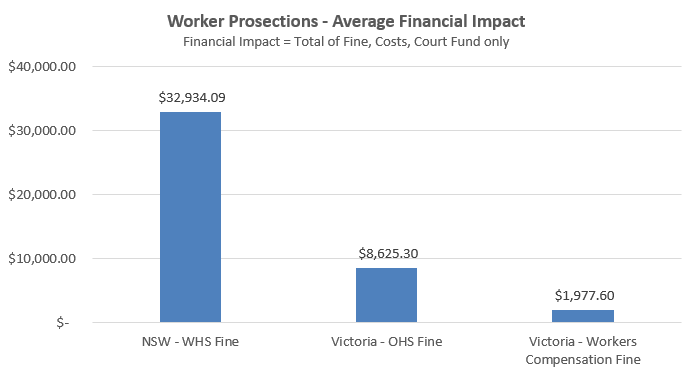 Interestingly, with respect to prosecutions against the Workers Compensation legislation in Victoria, in addition to workers being required to pay back any money accessed via fraudulent activity (which equated to a total of approximately $700,000), of the 19 prosecutions, 43% of workers were issued with a suspended imprisonment sentence. The average fine was $1,977.60. 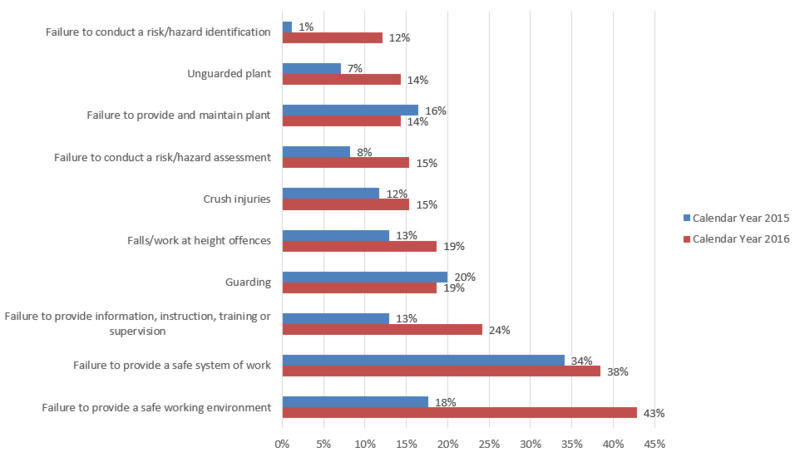 What Criteria are Regularly Associated with Health and Safety Prosecutions? With respect to the criteria/codes that lead to the prosecution – the top 10 criteria, as defined by WorkSafe Victoria, are outlined below. These criteria are consistent with 2015, with the exception of “Failure to conduct a risk/hazard identification” being added to the list and “Failure to notify VWA of a notifiable incident” being removed from the list. The introduction of “Failure to conduct a risk/hazard identification” places a clear duty on workplaces to establish explicit and robust processes that identify hazardous situations. Whilst many businesses can demonstrate an ability to manage risk once a hazard has been identified, this criteria requires workplaces to proactively look for hazards that are associated with their workplace activities. In addition to these criteria, other criteria noteworthy to report on includes Traffic Management and Forklifts both being associated with 8% of prosecutions. During 2016, internally, Action OHS Consulting observed a rise in improvement notices being issued by WorkSafe Victoria due to new client contact as a result of forklift use and traffic management practices. Assess their workplace risks. Consider listing all foreseeable hazards in the workplace, and document the current controls that have been established by your workplace. At this time, consider additional control strategies. Document these additional control strategies into an Action Plan to support implementation. Consider safety as part of your procurement process. Don’t make safety an afterthought. Consider safety when engaging contractors. Workplaces often engage contractors to support processes that they are not familiar with, which means new hazards may be introduced to the workplace. Prior to engaging contractors, along with cost, seek information from those you are about to engage to ensure that they can maintain the safe working environment that you have established. Establish an induction program. This may include a “buddy” being assigned to new and/or young workers. Ensure the induction includes an overview of your safety program and the operational activities that the worker will undertake. Identify how you will manage implementation. Spreadsheets and folders can be effective if you are organised, however, as technology solutions evolve, web-based platforms such as Safety Champion Software will support, guide and remind you when deadlines and/or key milestones approach. Apart from one of your workers being injured, a workplace incident and/or prosecution can have a negative impact on operations. Many large organisations, as part of their contractor and/or supplier programs, require businesses to report on their health and safety performance in their Tender applications or Invitations to Supply. A prosecution is likely to rule your organisation out of future engagements. In addition, a workplace that has been prosecuted may see this impact their brand. Not only may this see the general public decide to purchase from your competitors, it may also see your ability to access and retain talent damaged where workers have the ability to “choose” their employer of choice. If you are like the team at Action OHS Consulting and Safety Champion Software and get a real kick out of interrogating data to make sense of trends; a link to the health and safety prosecutions in Victoria and NSW for 2016 can be found by following this link: Consolidated Raw Data from Victoria and NSW Health and Safety Prosecutions: Calendar Year 2016. This information was compiled by our data analysis from the information available at both the WorkSafe Victoria and SafeWork NSW websites. If you would like more detail on our analysis, or provide us with an overview of your analysis or the trends that you see, please don’t hesitate to send an email to info@actionohs.com.au or contact us by telephone on 1300 101 OHS | 1300 101 647.